Yep - there was a lot of crazy at BEA and I really enjoyed myself! Upon entering the Javits Center, I got a sense that this is my kind of place. Huge banners announcing upcoming releases, displays of books and what surely is a reader's wonderland - free books! I met lots of awesome bloggers and found out about some really great books that will be released soon. Row upon row of publishers, large and small stretched for what seemed like a mile. 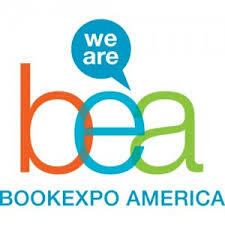 I still think I missed quite a few booths even though I used the BEA app to check off each one that I went too. Ahhh, the app - that didn't quite work for me. I really wish that once I marked something I wanted to check out, it would have gone straight to my agenda, but the only way I could figure out how to do that was to manually add it to the calendar. I messed up and completely missed one author I had arranged to meet. I still made it to several authors, some on purpose, some by complete accident. I just happened to walk by and found Lauren Myracle sitting by herself! I was also pulled into lines by other bloggers that said, "you have to read this author!" I also attended the blogger con which had some useful information but overall, was geared towards new bloggers. There were several issues covered including expanding your blog to real life, ethics and which format to use. These were low on information and when there was information, it could have been covered in five minutes rather than the hour scheduled. Panelists - have a plan! There was only one panel, Extending Your Blog Reach Online, headed by Malle Vallik from Harlequin, that even approached a professional attitude. The other panel I enjoyed was the Ethics lunch, but even that didn't get into questions I had about using images. There was a lot of disagreement about the correct approach to the fair use of covers in your review posts. It was also extremely dry and not very coordinated. Jane Litte tried to keep things moving but the other two lawyers seemed more like undertakers. * Bring in those front line publicists that handle blogger outreach. I really wish I was able to meet some of the people I talk to weekly about upcoming releases that they would like me to review. Come on, bosses! Give those people the morning off to meet with us at a breakfast. I know they are busy but since you use the free service bloggers provide in publicizing your wares, let us at least meet these people face to face! * Have one person in your booth that will address blogger concerns. Not all of us are outgoing or pushy enough to get invited to the "hot" parties. Since most of us book bloggers are really shy in person, a little outreach would be awesome! I was at least pushy enough to ask the people in the booths what they were excited about. I passed out a lot of cards and found some really exciting books I can't wait to share. Put a giant gold star or something on these people willing to talk to us bloggers. *Split up those panels to provide more content to more established bloggers. Most of the things the panels covered could easily be found online. Some just seemed like giant advertisements to get more subscribers for the panelists. I think the majority of us already know the basics. I want the next step like how can you actually make money by advertising. I only found snippets at each panel that were remarkable. I want a panel that is professional and polished, not full of "look at me!" stuff. Overall, the whole BEA experience is overwhelming and amazing. I did meet a lot of wonderful authors and bloggers. I don't know if I will ever be able to attend again because of the cost but it was worth going once. I think it will take me weeks to come down from the thrill of it all! Sounds like you had a great time! I am so happy for you! I missed this year, am really jealous ;-), and plan to get back to blogging now (after a crazy personal year). I never attended the panels when I went the year before last, and enjoyed your take on it. Seems as though a lot of it was geared towards new bloggers. Sounds like an awesome experience Mary! Glad you can share so much with us. I love your comment about most of us being shy in person. I wish I could have been invited to several parties when I attended last year, but wasn't, and so was kind of sad about that. Great post! Still very jealous! I'm glad I got to meet you during BEA! I'm glad you enjoyed the BEA. I attended in 2011 when bloggers were still handling the blogger convention and not the BEA. There was great networking with bloggers and authors there. Some good panels and some not. It sounds like the bloggers put together a better conference then the BEA. I hope your feet have recovered. LOL! I participated on Armchair BEA for the 1st time it was a great exp. and I learned a lot in doing so haha! Suzanne -- I have missed your blog! Can't wait to see it again. I have more Julia -- stay tuned. Lisa -- I think once is enough for me. I missed so many people that I wanted to meet but I did meet a lot of bloggers that were really wonderful! Kathy - it was a real pleasure, you were one of the first blogs I started following. I think I fan girled you a bit. Teddy -- I think I may have picked the wrong panels. I was in the YA ones and they were skewed young. Most of the bloggers didn't stick around for the networking and there were a lot of self published authors. The experience sounds awesome! Hoping to go next year!